There are 12 Houses in a traditional Horoscope. These House form trines – angles of 120 degrees – with each other. The Trine 1, 5, 9 signify the present, future and past, and the Native himself-his children-His Father (the circle of Evolution). 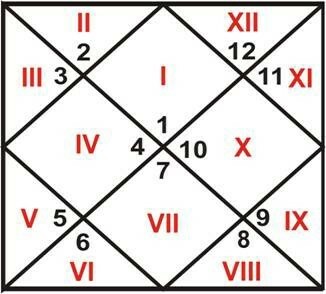 The 9th House of last birth is 5th House of this present Birth. The 10th House of the Last Birth is the 6th House of this Birth. To have a remedial measure work in this life, one needs to have his 5th and 9th House strong. The 5th and 9th House reveal the real nature of a native. The Trikonas have their own meanings. For Profession – 2-6-10; for Marriage – 2-7-11; for Child Birth – 2-5-11 and for Foreign Land – 3-9-12. 4-8-12 is called as the graveyard of all planets. Here, the wealth is hidden. 8th is the Mystery House – through this House, one can get unearned income. 12th is the House of Expenditures and Investments. 2-6-10 – 10th House signifies the name and fame earned through profession. 6th House signifies day to day work. Without work, one cannot have name-fame and dhana! 2nd House signifies dhana or income. Even if all these Houses are spoilt, the 10th House never lets a person down – at least not for 2 square meals, if one works sincerely and honestly. That is why we never find any ordinary worker also sleeping hungry at night. 3-7-11 – For business success, one requires sincere efforts, and help from the 7th House of Connections and the 11th House of Gains. The 3rd House signifies communications with people represented through the 7th House, through whom you will acquire gains (the 11th House). 3-9-12 – Without any of these 3 Houses activated, one cannot go abroad.